Boil water and add rice, salt and spices. Put oil in a frying pan and fry Robert Chicken Sausages briefly. Cut sausages into bites and mix them with the boiled rice. 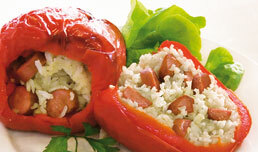 Hollow out the red peppers and stuff them with rice and sausages. Place them in the oven at 200º C for approx. 20-30 minutes.